I’ve been doing a lot of armour design work lately, primarily for Repair Her Armor and conceptual art for Wyrmhole Gaming‘s futuristic horror-punk Dead House; I’m intending on cosplaying a character from that game for this year’s ConnectiCon, where they’ll be running an open playtest for their system, and I’ve reached the stage where I can consider buying materials. As a former member of re-enactment and living history companies, I have a strong interest in accurate armour design. Featurettes about design work for films such as Lord of the Rings are fascinating for me — I have a lot of respect for John Howe, whose living history association, Company of Saynt George, features in some of my reference books. I love when effort is made towards making armour — even sci-fi or fantasy armour, where historical accuracy can be thrown out the window and style is open to experimentation — look like it’s not only functional but as comfortable to wear as armour can be. So I might be a bit biased with regards to preferring games and films where people aren’t running half-naked into a battle. A lot of terrible armour design has been committed over the years in the name of style and visual design. But what if you want to design armour that isn’t traditional? Well, the trick — as with all things — is to know and understand the rules before you go about breaking them. Welcome to Armour 101. The most persistent design error is in armour layering. Armour is intended to protect vitals, but there are areas such as the insides of the elbows, armpits and knees where flexibility is required; obviously you can’t just wrap plated leather over those areas and call it a day. These are also locations containing vital tendons and arteries, so leaving them unprotected is a fairly effective method of suicide. Additionally, bearing a heavy suit of armour over unprotected skin or a simple shirt will leave vicious bruises, particularly on the shoulders and upper chest area (I don’t speak from personal experience, but I know someone who can). 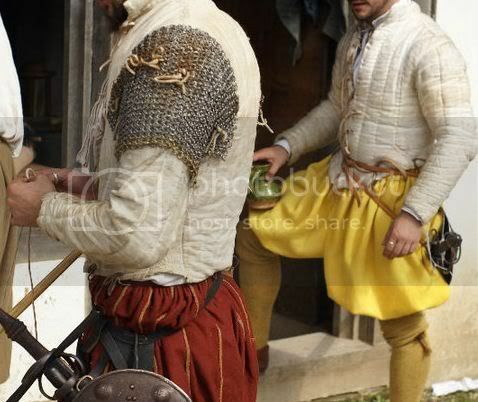 The typical mediaeval knight wore a padded gambeson or arming doublet with gussets of chain sewn over the exposed joint areas beneath their armour. The padded under-layer includes leather straps or ties which are used to secure the armour in place. This detail is frequently neglected in a lot of game armour — many games show plate armour as being too close-fitting to possibly have anything lighter than a silk shirt or layer of leather underneath, if anything at all. This happens frequently in films as well, where design accuracy may be sacrificed for style and making the primary characters more recognisable. Chain mail. Effective protection against swords, not so good against arrows, poignards and smaller daggers. 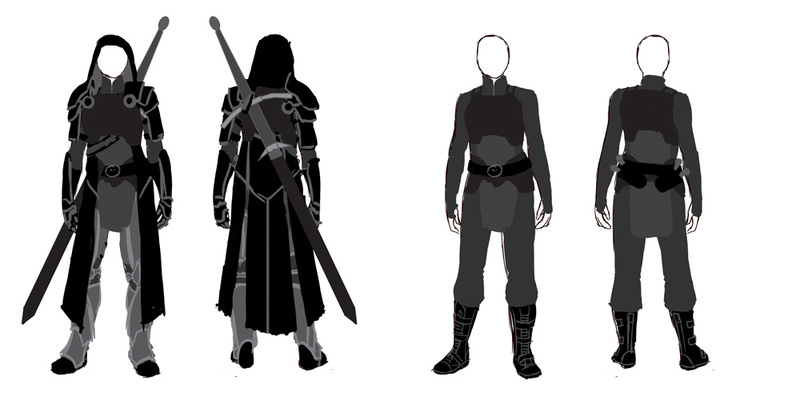 The result of leaving the under-layer out in the design phase is that the remainder of the armour may be too tight. Freedom of movement is essential — and far more possible than one might think even in a full suit of plate armour. As I’ve mentioned before, it’s possible to engage is extreme athletics whilst wearing armour — or it ought to be. Armour is not a corset, nor is it intended to be. 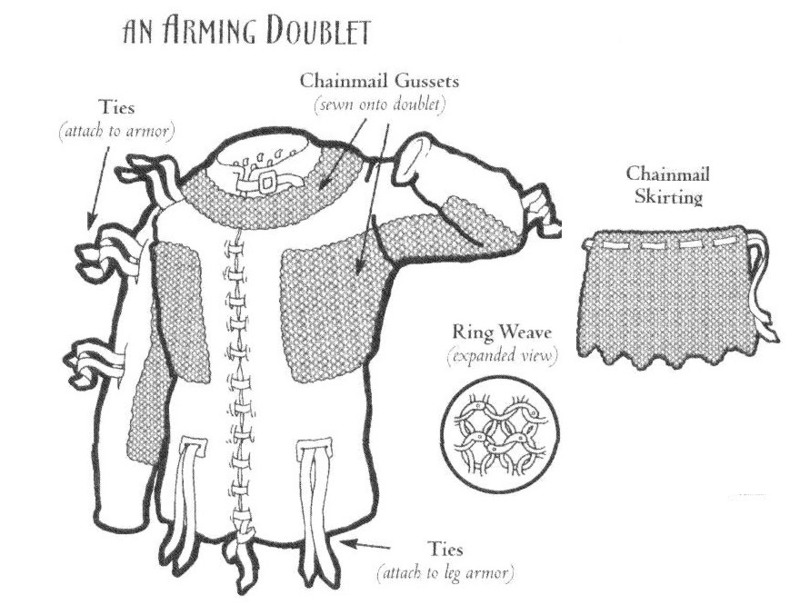 If it’s close-fitting plate over padding, it needs to be lapped or else the person inside cannot do their job; if it’s a padded brigandine or jack, it needs to be loose enough for the wearer to be able to fold their arms. So where is protection most needed? Everywhere. If a piece of armour doesn’t help absorb impact, hinder stabbing, or guard against cutting, it needs to guide piercing attacks away from the most vulnerable areas. This last is an important factor when designing fantasy plate, as many designers lean on a thorny, intimidating appearance which would render mobility impossible and cause enemy weapons to get caught on the surfaces. Important factors are the knees, elbows and shoulders — spikes in the wrong locations or pointing the wrong direction would cause plates to lock, or worse, stab the wearer, and bear in mind that if metal plate gains more than an average thickness, it’ll be unreasonably heavy — big chunky pauldrons look awesome and are used all too frequently in games, but are more likely to hinder than help a character. 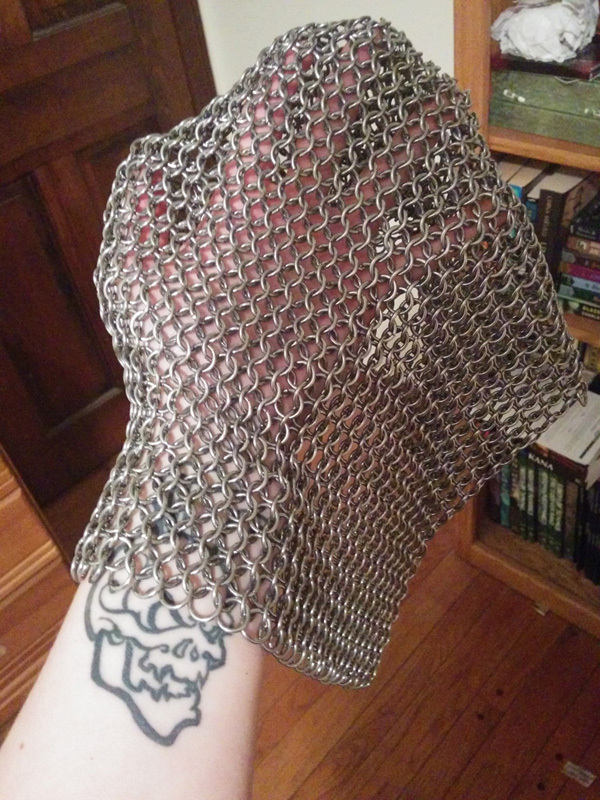 Conversely, if a body part’s sole protection is limited to a piece of fabric or nothing at all — a popular non-tactic for “barbarian”-type classes, and all too common an occurrence when ill-fitting pauldrons do not provide more than a passing acquaintance with protection — you may as well have gone in starkers. 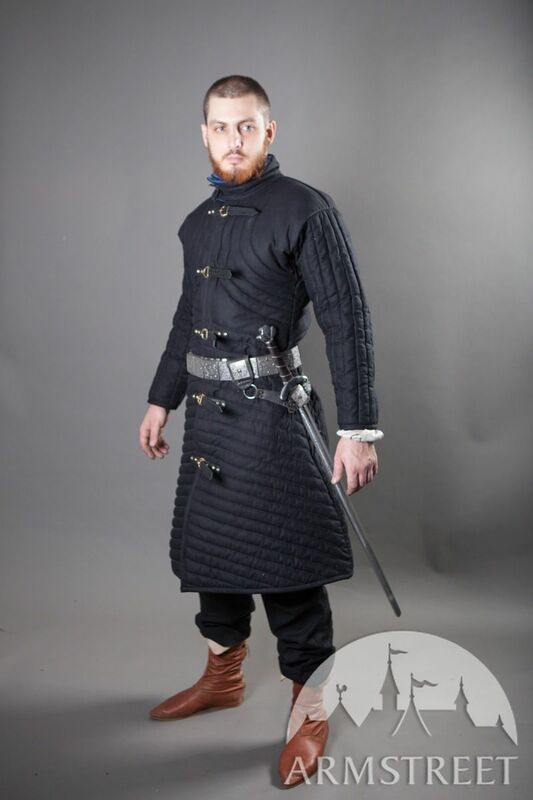 Sometimes you can go light in one area if there’s something elsewhere to compensate; for example, a longer gambeson or chain skirt instead of full leg armour, or a full chain shirt over a gambeson beneath a breastplate rather than pauldrons and upper-arm plates. Unless someone was very wealthy, armour was more likely to be made of essential parts purchased as they could be afforded, and there was a surprising amount of variation. One size fits most. Not glasses-compatible. Then there’s headgear. 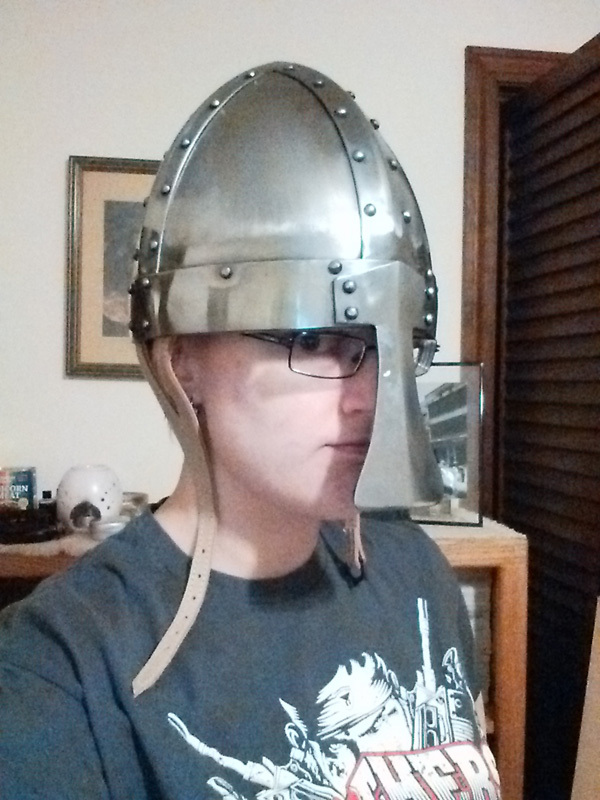 I’ve been playing Dragon Age again, and the metal helmets bother me because they’re too small. The pic on the right is my spangenhelm; it only looks oversized because I’m not wearing an arming-cap underneath, and I haven’t finished lining it for the chain aventail (see above pic for the chain). It also looks flat-out ridiculous (especially if I’m not wearing any other armour), but one combat scar on my face is more than enough. I learned the hard way in Dead House that forgetting a helmet on a close-combat character is a good way to get one’s virtual head split like a watermelon — with something like the spangenhelm, the spans would deflect an overhead blow off to the side. Even modern military helmets are fairly bulky, because the last part of the body you want to leave exposed is the head. And yet, in Kingdom of Heaven, the first thing Balian does during any battle is make certain he isn’t wearing a helmet. I love that film, particularly the director’s cut version, but that detail always irks me. The heroic long hair flowing in the gore-flecked winds of battle is much less heroic when you’ve painted a big shiny target on your forehead. So now that we’ve covered the basics of traditional armour — under-layer protection, manoeuvrability, outer-layer defense, and headgear — let’s apply it to, for example, sci-fi armour. You’re unlikely to be flailing about with swords (unless you have a scenario where blades are preferred due to the potential for vapourising a hole in a ship’s hull and depressurising the section you’re standing in) so you’re looking for an underlayer that mitigates the effects of energy discharge and an outer layer that deflects projectiles. If your fantasy characters are using rapiers, you’ll want to forego chain in favour of armoured brigandines, because all those holes won’t do as much good against a fine-tipped pointy object. And bear in mind the characters’ jobs: a mediaeval pikeman wouldn’t wear the same armour as a cavalry officer, and a sci-fi police officer wouldn’t wear the same armour as a career space marine (non-capitalised). Conversely, if the character’s intended to get in other characters’ faces with a sword, don’t have them lightly dressed. And for the love of little fuzzy kittens, give them headgear. Multiple layers make a swordfighter happy.